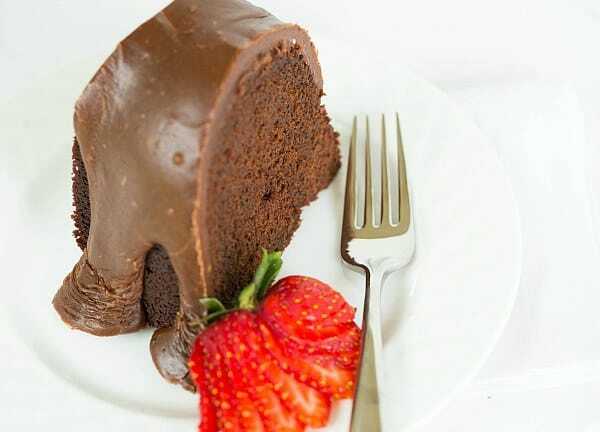 I started the journey to this chocolate cake with a chocolate pound cake as my goal. 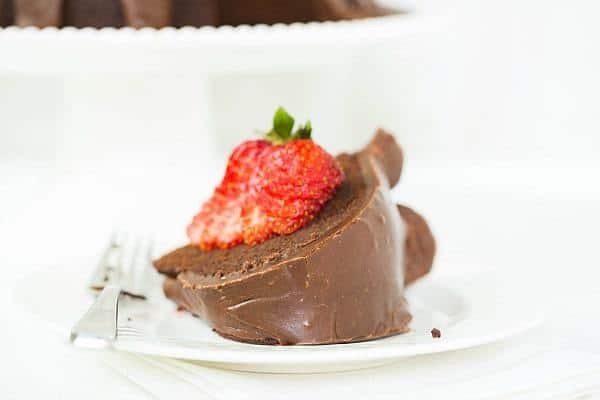 After I shared the strawberry swirl cream cheese pound cake last month, I received more than a few requests from readers asking for a chocolate pound cake recipe. I was almost as stunned as you were to realize that I didn’t have one in my repertoire yet. I set out to remedy that, but was more than a little underwhelmed by the recipes that I was finding. They were all severely lacking in the chocolate department; most just threw some cocoa powder into a regular pound cake recipe. That wasn’t good enough for me. I wanted chocolate, for crying out loud! I turned my attention to finding a fabulous, moist chocolate Bundt cake and find it, I did! I couldn’t leave well enough alone, so I topped it with chocolate fudge icing. I don’t know about you, but I just can’t eat a naked chocolate cake! Let’s be honest, here. There’s absolutely nothing worse than a dry chocolate cake. Yet, there are few things in the food world better than a dense, moist, melt-in-your-mouth chocolate cake. The secret? Packing the cake with moisture and making sure you don’t overbeat it. 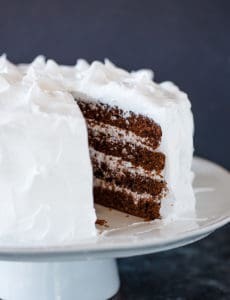 In this recipe, both boiling water and sour cream are used to ensure that the cake doesn’t dry out. 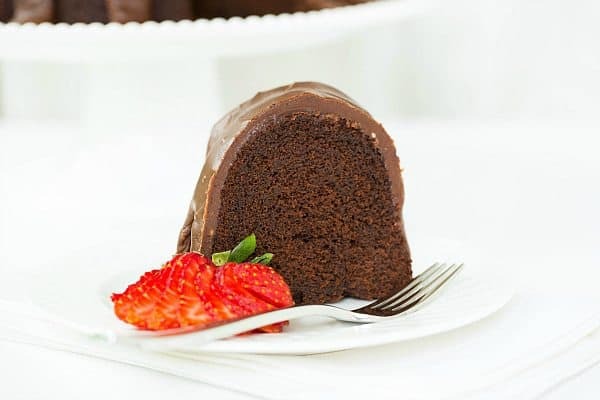 They do a fabulous job, as this is, hands-down, one of the two best chocolate Bundt cake recipes I’ve ever seen (the other being the fabulous Root Beer Float Cake). The recipe for this cake didn’t call for an icing or frosting, just a mere sprinkle of powdered sugar, but I had to dress it up. I settled on a boiled chocolate fudge icing that is very reminiscent of the icing used on Texas Sheet Cake. As in, I would prefer to just sit with the pot of icing and a spoon and call it a day. 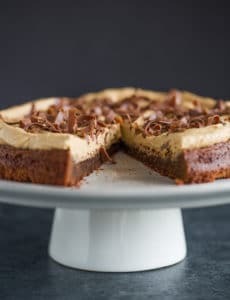 The cake and icing combo makes for a very rich dessert, but I think it would be just perfect with a scoop of vanilla ice cream to offset the chocolate flavor. (Somehow my new freezer doesn’t have vanilla ice cream stocked yet, a tragedy!). 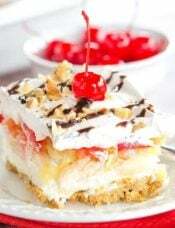 You could also serve the cake with whipped cream or fresh fruit. Or eat it plain. For breakfast. Bill Cosby approves and I won’t tell. 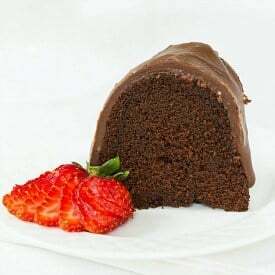 While I think I’ve officially retired my search for a chocolate pound cake recipe given the sheer fabulousness of this cake, if you have a chocolate-lovers chocolate pound cake recipe, please feel free to share it below or send it to me! 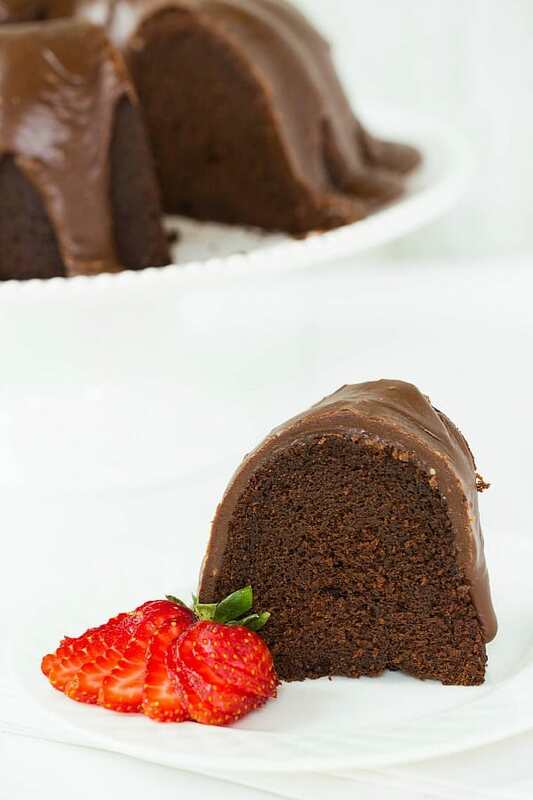 A fabulous dense, moist chocolate bundt cake topped with a rich chocolate fudge icing. 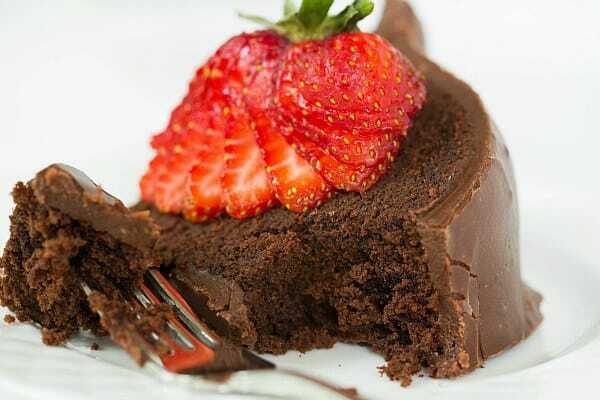 Make the Cake: Stir together the 1 tablespoon melted butter and 1 tablespoon cocoa powder until fully dissolved. Using a pastry brush, coat the entire interior of a standard 12-cup Bundt pan; set aside. Stir together the cocoa powder, chopped chocolate and espresso powder in a medium heatproof bowl. Pour the boiling water over the mixture and whisk until everything is completely melted and smooth. Set aside to cool to room temperature, then whisk in the sour cream. In a separate medium bowl, whisk together the flour, baking soda and salt. Using an electric mixer, beat the butter, sugar and vanilla on medium-high speed until light and fluffy, about 3 minutes. Reduce the speed to medium and add the eggs one at a time, beating well between each addition and scraping the sides of the bowl as needed. Reduce the speed to medium-low and add one-third of the flour mixture and half of the chocolate mixture and mix until just incorporated. Scrape the sides of the bowl and repeat with half of the remaining flour mixture and the rest of the chocolate mixture. Finally, add the last of the flour mixture and beat until just incorporated. Scrape the sides and bottom of the bowl and beat on medium-low for 30 seconds to thoroughly combine the batter. 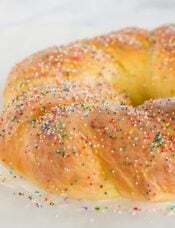 Pour the batter into the prepared Bundt pan and bake until a skewer inserted into the center of the cake comes out with just a few crumbs attached, 45 to 50 minutes. Place the pan on a wire cooling rack for 10 minutes, then turn the cake out onto the cooling rack and cool to room temperature, about 3 hours. 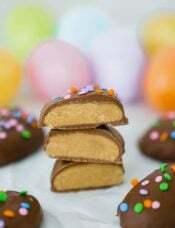 Make the Icing: In a medium saucepan set over medium-high heat, bring the butter, cocoa powder and evaporated milk to a boil, whisking occasionally. Add the powdered sugar, vanilla extract and salt and whisk continuously until the mixture becomes smooth, about 30 seconds. The cake can be stored in an airtight container or wrapped with plastic wrap at room temperature for up to 3 days. Do you have the ingredients in weight please?? Hi Chandra, Just click on the link that says “Metric” at the bottom of the ingredient list and they will flip over to weights for you. This cake has come out the best it’s ever come out. And I’ve made it about thrice before. It’s buttery, spongy and so light. I didn’t have light brown sugar so used dark and it’s sublime. It is quite dark this time because I didn’t have callebaut cocoa and callets, so used hintz cocoa and lindt 70% dark chocolate. Went to some friends house last Saturday to grill steaks.. I can make a pound cake with carmel frosting but I wanted to make something chocolate. I made the cake and I liked it but the test was if others liked it. Everyone loved it. My husband says it was the best cake I’ve ever made! It was easy and only a small slice is left. New to baking but after I successfully made other recipes on your site (cookies mostly, thank you) I decided to try out this cake and it didn’t turn out. It looked beautiful but it was dry (flavor and texture) and crumbly and not fudgy looking like the photo. I followed the instructions exactly …except it’s been cold and my butter didn’t soften as much as usual and I use a electric hand mixer. The icing was ok but I didn’t know if i was to leave it at a boil after adding the sugar and I moved the temp down cause I didn’t know if i was burning it. Could you clarify for three newbies? Hi Teri, Using a hand mixer shouldn’t be an issue, but if your butter wasn’t fully softened, that could be the culprit. Incorporating butter that it still a bit cold gives baked goods more of a pie crust/shortbread texture. Definitely give the butter time to soften completely! Made the cake yesterday for my husband”s birthday and it was a super hit. Followed the recipe as is. The cake was moist and had a tender crumb. It was easy to put together. Thanks for a great recipe with easy to follow instructions. I just made the cake and it looks lovely. Came out of pan no problem. I am having trouble with the icing. I’ve tried it twice…never came to a boil and the butter separated out of the evaporated milk and cocoa mixture. Not sure what I’m doing wrong. Can I just heat it until smooth then add the powdered sugar? Hmmm that’s so strange! Yes, you could try heating until smooth and then adding the powdered sugar. I made this cake on Thursday night to take to work for my birthday. What a hit! Everyone gave it rave reviews and asked for the recipe. It was super soft, and moist. I used my own chocolate ganache icing made with Cadburys dairy milk chocolate and cream and simply poured it over the cake once cooled. Def worth the calories and the perfect spoil for your birthday. I was a little concerned when I read that I needed to add baking soda and no baking powder and when the batter came out looking mousse like and fluffy I thought I had done something wrong. The stress was unnecessary – the cake came out beautifully. 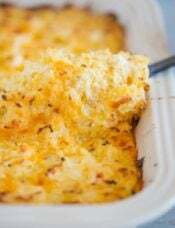 Thank you for a great recipe – I will be using it again and again. Mine was delicious but it was really cakey not so dense and rich as yours, it didnt seem like a pound cake more like a cake ;)) thanks anyway! 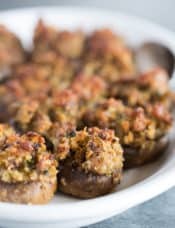 Longtime fan of your website/recipes. I just got a Bundt pan for my birthday last weekend and I am looking for recipes. I just knew you would have a great one. 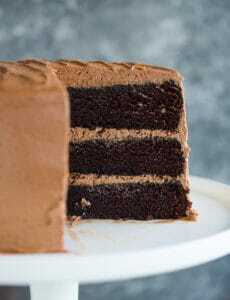 This chocolate cake looks like it’s going to be my next cake! Tahnk you! 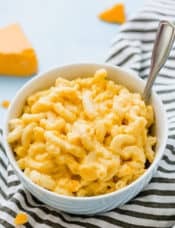 I just made this recipe for my husband’s birthday today. So luscious and it truly is a WOW. I did not have enough sour cream so I did something unthinkable and healthy…I used homemade kefir. He’ll never know, he only thinks I am now a fantastic baker because of your recipe…thank you much for helping me shine today! Aw, you are so welcome! Happy birthday to your husband! I made the icing for use on a chocolate bundt cake filled with coconut-egg white-sugar filling. Très magnifique! Pours easily and hardens quickly. I used the entire batch to top one standard cake mix sized bundt, which was too much. The icing hardened into a sugary 1 1/2 inch icing mound in the center of the cake. I would either make 2/3 to 1/3 of the recipe next time. Super rich and tasty (tho sugary). It might be a good base to add a tablespoon of liquour to for additional flavoring. Using flaked or course salt also add a nice counter bite to the sugariness. Will use this recipe as an icing standard.